This privately owned apartment has been tastefully decorated & extensively refurbished. 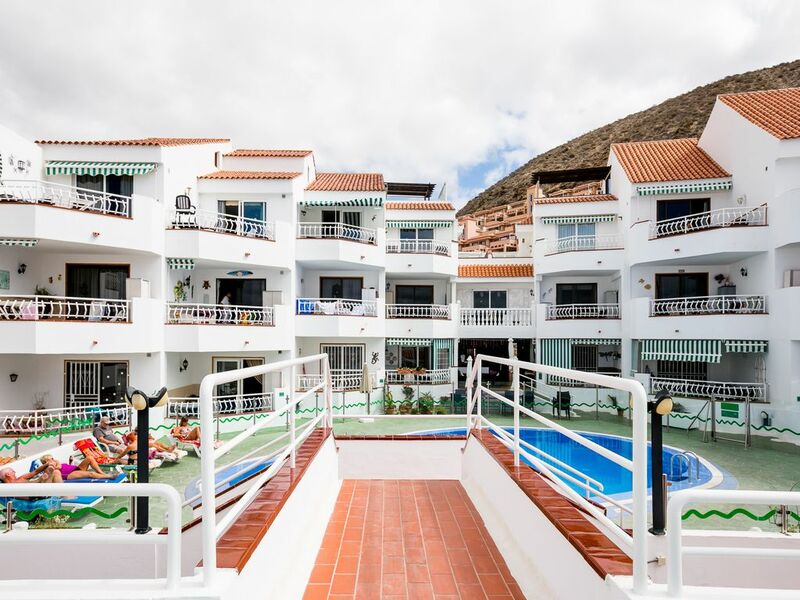 It is located in Oasis Del Sur a quiet upmarket suberb of Los Cristianos,its a 5 minute walk to the best strip of excellent bars & International restaurants in Los Cristianos & it's a 15 minute stroll down to the beach&town centre. In the lounge/dining area there are 2 leather3 & 2 seater sofas,plus dining table & 4 chairs. There is 32 inch HD LCD TV, with over 30 UK Channels including,all the major UK terrestrial ones.. The Accommodation: This complex is designed over separate phases, each phase having its own private swimming pool, and sunbathing terraces. the Complex also has an on-site supermarket and two Poolside bars both serving snacks and hot food. Tenerife is a fantastic family destination, it has some great Water & Animal Parks,which are well worth a visit. The biggest two are Siam Park, a World Class water park and Loro Park which is of a similar standard to Seaworld in Florida. Aquapark and Junglepark are also well worth a visit,there are also smaller attractions like the nearby Monkeypark which are very popular. Good sized apartment, big enough for 2 adults and 2 teenagers. What a great holiday. This is a very nice apartment and although it is up a few hills ,it is in a very good central location in Los Cristianos. There was very good communication and lots of information provided from the owners. The apartment's pool and bar were lovely, we would definitely stay here again. Lovely property plenty of space for 4 Adults.We had to do all our cleaning.People very friendly and helpful.Local good resturants to go to when we did'nt want to go to the main town.The supermarket was great could'nt be any closer.We spent all our days on the beach,excellent taxi service. Stayed here over New Year 2018. Apartment is in a good location, plenty of bars and restaurants nearby, but mainly for families which was good. It’s up a bit of a hill, but nothing strenuous, and if you can’t manage the walk, then you need to have a serious look at your level of health/fitness. There is working WiFi in the apartment also, which I didn’t use at all, but it meant we didn’t have miserable children. Great location for a Christmas holiday. We stayed with our parents and were welcomed in to join in the celebrations with the other residents for Christmas. We enjoyed an excellent Christmas dinner, homemade fish and chips and Sunday lunch and were treated like friends. The apartment was clean and well equipped with comfortable beds and a lovely clean and quiet pool area. We hired a car to explore the island.We were provided with excellent information for checking in. Handy supermarket nearby for supplies.Our first time to Tenerife and would love to stay here again. Los Cristianos, once a small fishing village, still retains its charm, and is a delightful place to stay. There are an abundance of outdoor cafes, restaurants and bars along the promenade. In the town there is a picturesque square with some excellent shops, it also boasts a popular Sunday market. This resort is an ideal destination for families and couples of all ages, who appreciate the terrific all year round climate with temperatures rarely dropping below 70F. There is a regular ferry that take you to the islands of La Gomera, El Hiero and La Palma or you could take one of the great variety of excursions eg see The Volcanic Mount Teide the highest mountain in Spain. There is a fantastic local water park Aqualand and the New Theme Park Siam Park both are ideal for the children and adults alike with a free bus which picks up in the local area. There are various boat trips from the harbour to watch the whales and dolphins and also a number fishing trips.